Fodmaps is becoming an important diagnosis now, which diagnosis is still missed by many doctors. If you have IBS, aask your doctor to test you for fodmaps. Read below. My nephew, sister-in-law and several others I know are on gluten-free diets, helping to support a market for these foods that is expected to reach $15 billion in annual sales by 2016. Supermarket shelves are now packed with foods labeled gluten-free (including some, like peanut and almond butter, that naturally lack gluten). Chefs, too, have joined the cause: Many high-end restaurants and even pizza parlors now offer gluten-free dishes. Those who say they react to gluten, a protein in wheat and other grains, report symptoms like abdominal pain; bloating; gas; diarrhea; headache; fatigue; joint pain; foggy mind; numbness in the legs, arms or fingers; and balance problems after eating a gluten-rich food. I suspected at first that the gluten-free craze was an attempt by some to find a physical explanation for emotional problems, similar to the “epidemic” of hypoglycemia in decades past. But a growing body of research indicates that many may be suffering a real condition called non-celiac gluten sensitivity, or NCGS. It is not celiac disease, a far less common autoimmune condition that can destroy the small intestine. 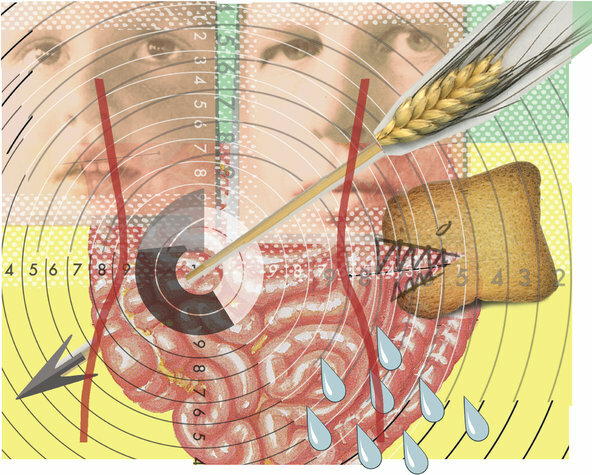 Indeed, no one has conclusively identified a physical explanation for gluten sensitivity and its array of symptoms. Recent studies have strongly suggested that many, and possibly most, people who react badly to gluten may have a more challenging problem: sensitivity to a long list of foods containing certain carbohydrates. Many of their subjects still had symptoms on a gluten-free diet, however, which prompted a second study of 37 patients with irritable bowel syndrome and non-celiac gluten sensitivity who were randomly assigned to a two-week diet low in certain carbohydrates, collectively called Fodmaps. All patients on the special diet improved, but got significantly worse when fed gluten or whey protein. Only 8 percent of the participants reacted specifically to gluten, prompting the researchers to conclude that Fodmaps, not gluten, accounted for most of the distress. ■ Fructose: A sugar prominent in apples, pears, watermelon, mangoes, grapes, blueberries, tomatoes and tomato concentrate, and all dried fruits; vegetables like sugar-snap peas, sweet peppers and pickles; honey; agave; and jams, dressings and drinks made with high-fructose corn syrup. ■ Lactose: The sugar in milk from cows, goats and sheep, present in ice cream, soft cheeses, sour cream and custard. ■ Fructans: Soluble fiber found in bananas, garlic, onions, leeks, artichokes, asparagus, beets, wheat and rye. ■ Galactans: Complex sugars prominent in dried peas and beans, soybeans, soy milk, broccoli, cabbage and brussels sprouts. ■ Polyols: The sugar alcohols (sweeteners) isomalt, mannitol, sorbitol and xylitol, present in stone fruits like avocado, cherries, peaches, plums and apricots. People with irritable bowel syndrome often find that their symptoms lessen or disappear when avoiding foods rich in Fodmaps; however, it can take six to eight weeks on a low-Fodmap diet to see a significant improvement. Experts advise those patients to eliminate all foods rich in Fodmaps at the start. (You can find a list of foods low in these carbohydrates at stanfordhealthcare.org.) Once symptoms resolve, individual foods are returned to the diet one by one to identify those to which patients react. So what about patients who think they are sensitive only to gluten? Dr. Joseph A. Murray, gastroenterologist at the Mayo Clinic and an expert on celiac disease, urges that they first be tested for celiac disease, a condition that has become dramatically more prevalent in recent decades. The signs of gluten sensitivity often mimic those of celiac disease, as well as irritable bowel syndrome. ■ Negative blood tests for celiac disease and no sign of damage on an intestinal biopsy. ■ Symptom improvement when gluten is removed from the diet. ■ Recurrence of symptoms when gluten is reintroduced. ■ No other explanation for the symptoms. It is not yet known if the condition results from an immunological reaction similar to that seen in celiac disease, or whether gluten exerts a chemical or other negative effect on digestion. Gluten sensitivity is not the same as a wheat allergy, a far less common problem with symptoms like swelling, itching, skin rash, tingling or burning of the mouth, and nasal congestion. The best way to test for non-celiac gluten sensitivity (after ruling out celiac disease) is to remove all sources of gluten from one’s diet for several weeks. If the symptoms disappear, reintroduce gluten to see if they recur. Another option is to keep a food diary for a few weeks, recording everything you eat and drink and any symptoms that follow. In addition to the inconvenience and added expense, a gluten-free diet can result in a poor intake of fiber and certain essential nutrients. It may be wise to consult a registered dietitian if you plan to go gluten-free. Posted on April 6, 2015, in Uncategorized. Bookmark the permalink. Leave a comment.